The German trade surplus widened to 19.38 billion euros in December from 18.84 billion euros in November. It was only slightly smaller than its 20.77 billion euro surplus of 12 months ago. While German industrial data are showing encroaching weakness and while that is also being reflected in service sector weakening, nominal exports rebounded in December and are actually showing accelerating growth from 12-months to six-months to three-months. While that may seem encouraging, it is only on the surface. In real terms, German exports are still struggling. Real German exports are weak on all horizons. They are lower by 1.8% year-over-year and falling at a 2.3% annual rate over six months, but up at a 0.8% pace over three months. The inflation adjusted export data are available only through November. So these calculations do not account for or dissect the nominal gain in exports in December. German nominal imports are restrained over this horizon as well. They did rebound by 1.2% in December but that followed a 1.3% drop in November. Nominal imports are up by 4.1% over 12 months, up at a 3.4% pace over six months, and rising at a 2.5% annual rate over three months. None of these performances is impressive. In real terms, import growth over the past year is trapped in a growth range around +/- 1%. German trade data do not seem to be quite as weak as German industrial data. But it is a bit hard to make sense of this since industrial production all around Germany is fading. So neither is there much in this report to give rise to much optimism. Industrial output among EMU members remains weak and largely shows declining trends mixed with outright declines. Export growth faces strong headwinds here. Of the ten EMU nations listed in the table, six show output declines in December, five show output declines in November, and five show output declines in October. Clearly, output declines are no one-off event. Those metrics translate into output declines over three months for 7 of 10 EMU members – a shockingly high proportion. Eight show declines over six months and eight show declines over 12 months. 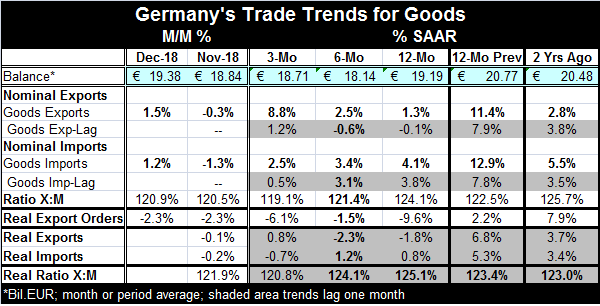 Clearly, there is a great deal of weakness on the industrial side and so much so that the modest German nominal trade figures seem a breath of fresh air. In the quarter-to-date, EMU members show manufacturing output declines in seven of 10 reporters in the table. There are gains from Finland, tiny Malta and highly volatile Spain. Only Finland shows manufacturing IP gains over all horizons in the table from 12-months to six-months to three-months. For most, it is the output increase that appears to be sporadic. News that U.S. President Donald Trump will not be meeting with Chinese Premier Xi before the trade deadline passes is unexpected and shocking. President Trump had said that he wished to meet with Xi before approving any trade deal. But now the deadline to boost tariffs will loom ahead of a Trump-Xi meeting and we have no clarification on what that will mean for tariffs that are schedule to go up on March 2. Does Trump have an unexpected scheduling problem, or is this a sign that the trade talks are not doing well enough for a Trump-Xi meeting to matter? The United States has threatened to increase tariffs on $200 billion worth of Chinese goods to 25% from 10% if a deal is not reached by March 2. Up until now, we have always been told that this is a hard date for action. At this point, there are all sorts of concerns about global growth. Some of the weakness undoubtedly stems from concerns about trade policy and tariffs. These concerns have centered on the U.S. and China. But the U.K. and the EU also are locked in a deadly trade negotiation embrace. The U.S. MCA (new NAFTA) deal is not yet approved and other U.S. trade negotiations percolate on the sidelines. Trade remains a huge international enigma on many fronts. Mr. Trump has changed his mind before. Would he push back this deadline on China or approve a deal with China without a face to face with Xi? Or are talks really progressing too poorly? Could Trump reschedule and meet Xi in time after all, heading of tariff increases at the pass? No one knows. It seems that being unpredictable is part of the Trump bargaining strategy. Meanwhile, the EU has cut its growth forecast for this year to 1.3% from 1.9%. The growth projection for next year is now trimmed to 1.6% from 1.7%. Growth in both the euro area and the larger EU28 area is deemed to have slowed to 1.9% in 2018 from 2.4% in 2017, the EU said. The earlier projection for 2018 expansion for both regions had been set at 2.1%. Clearly, these sorts of growth shortfalls and markdowns from already tepid readings are not what is desired. The U.S. has become a scapegoat of convenience. But it is Germany that is only spending 1.5% of GDP in NATO and has been urged to increase it to 2%. And it is Germany, the most fiscally sound economy in Europe, that is running at fiscal surplus at the same time – a macroeconomic policy that stifles growth in the region as well as at home. So is it surprising that in a poll today, 85% of Germans see U.S.-German ties as negative? It remains quite surprising to me that the U.S. can do so much for other countries without gaining favor. But when it pulls back a little, it is criticized for being selfish when selfishness is the law of the land and has been elsewhere...forever? Angela Merkel started it by calling the U.S. a bad ally when Trump tried to pressure Germany to pay its fair share in NATO...or else. Previously, Obama has made the same appeal. Europeans like Obama better than Trump because Obama never ever said 'or else...' Who has been the bad ally in this relationship? German finances can well afford this. Is the U.S. to blame that Germany puts fiscal responsibility above the priority of national defense and pulling its own weight? Maybe, Germans have been studying the wrong history all these years and need a refresher? Based also on the EU treatment of the U.K., I'd say history is poorly understood in most of Europe.